Tomorrow and Friday I will be at API Strategy and Practice conference in New York City. I’ll be talking about Tiggzi Platform, APIs and API plug-ins. I will be using ESPN API (Mashery) to show how fast you can build a mobile app in the cloud. Learn how to create a jQuery Mobile app with Wordnik API using Tiggzi Platform. Tiggzi isn’t just a mobile app builder. As a mobile app platform, it also provides a growing list of back-end services (like a database service) for seamless integration into the apps. Just us for this hands-on demo and overview of the currently available back-end services and the road map for the future. There will be plenty of time set aside at the end for Q&A. We just added some really cool features to Tiggzi Platform. Check them out! As we continue to make Tiggzi Platform enterprise-level, just just added a Source view where you can see and open the actual files behind your app. 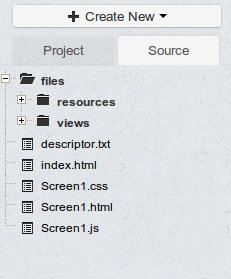 Right now the files are opened as read-only but we are working on allowing you to modify them as well. We got all our custom themes back and you can also create new themes using the jQuery Mobile ThemeRoller tool. Simply create your theme in the tool, download and then upload to Tiggzi. It’s that simple. 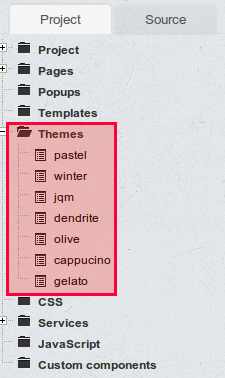 Once you create a new theme, select Create New > Theme and upload the theme you created. You have been asking for this feature and now it’s here. Customize the permissions for your app before building a binary. Don’t forget to check our new tutorials and as always, if you have any questions let us know via email, forum or @tiggziapps. AT&T recently launched new In App Messaging API. The API makes it very easy to send SMS message from your mobile app, using your own number. Another great feature is that now you can send a message to any mobile number, regardless of carrier. To make it as easy as possible to use this API, we added a plug-in to Tiggzi Platform. The plug-in has all the API pre-configured and comes with a sample app. If you don’t have one yet, sign up for ATT Developer account. Register a new app. When you enter app details, check In App Messaging from Mobile Number (Beta). You will need to use the App Key and Secret values when we import the plug-in. We’ll come back to this page a little bit later to set the callback URL. Let’s go to Tiggzi Platform. Create a new app in Tiggzi. Next, under Communication category, select ATT In App Messaging API and Sample App (you can also search for it). The Sign In to AT&T button will only appear if you need to sign in into AT&T to authenticate. The area to send the message won’t be displayed. If you are authenticated, then only the section to send the message will be displayed. That’s everything and test the app in desktop browser. When you test the app in a desktop browser, to authenticate you will need to enter your mobile number to get a 4-digit code. When you test on the mobile device, you won’t need to do this. To test on the mobile device, email the link to the device or simply scan the QR code in Test window. As you can see, it’s very simple to start using AT&T In App Messaging API in your app. If you have any questions, please post them on our forum or email us at support@tiggzi.com. Final note, this plug-in only works when running the app in the browser. As the API requires oAuth 2 authentication, it won’t in a PhoneGap (hybrid) app. We will update the plug-in to work in a PhoneGap app as well. Join us for this quick review of how to build a Windows 8 app using the Tiggzi Platform, plus “office hours” to answer any questions you might have about Tiggzi.